St. Augustine is a fourth century philosopher whose groundbreaking philosophy infused Christian doctrine with Neoplatonism. He is famous for being an inimitable Catholic theologian and for his agnostic contributions to Western philosophy. He argues that skeptics have no basis for claiming to know that there is no knowledge. In a proof for existence similar to one later made famous by René Descartes, Augustine says, “[Even] If I am mistaken, I am.” He is the first Western philosopher to promote what has come to be called "the argument by analogy" against solipsism: there are bodies external to mine that behave as I behave and that appear to be nourished as mine is nourished; so, by analogy, I am justified in believing that these bodies have a similar mental life to mine. Augustine believes reason to be a uniquely human cognitive capacity that comprehends deductive truths and logical necessity. Additionally, Augustine adopts a subjective view of time and says that time is nothing in reality but exists only in the human mind’s apprehension of reality. He believes that time is not infinite because God “created” it. Augustine is the first ecclesiastical author the whole course of whose development can be clearly traced, as well as the first in whose case we are able to determine the exact period covered by his career, to the very day. He informs us himself that he was born at Thagaste (Tagaste; now Suk Arras), in proconsular Numidia, Nov. 13, 354; he died at Hippo Regius (just south of the modern Bona) Aug. 28, 430. [Both Suk Arras and Bona are in the present Algeria, the first 60 m. W. by s. and the second 65 m. w. of Tunis, the ancient Carthage.] His father Patricius, as a member of the council, belonged to the influential classes of the place; he was, however, in straitened circumstances, and seems to have had nothing remarkable either in mental equipment or in character, but to have been a lively, sensual, hot-tempered person, entirely taken up with his worldly concerns, and unfriendly to Christianity until the close of his life; he became a catechumen shortly before Augustine reached his sixteenth year (369-370). To his mother Monnica (so the manuscripts write her name, not Monica; b. 331, d. 387) Augustine later believed that he owed what lie became. But though she was evidently an honorable, loving, self-sacrificing, and able woman, she was not always the ideal of a Christian mother that tradition has made her appear. Her religion in earlier life has traces of formality and worldliness about it; her ambition for her son seems at first to have had little moral earnestness and she regretted his Manicheanism more than she did his early sensuality. It seems to have been through Ambrose and Augustine that she attained the mature personal piety with which she left the world. Of Augustine as a boy his parents were intensely proud. He received his first education at Thagaste, learning, to read and write, as well as the rudiments of Greek and Latin literature, from teachers who followed the old traditional pagan methods. He seems to have had no systematic instruction in the Christian faith at this period, and though enrolled among the catechumens, apparently was near baptism only when an illness and his own boyish desire made it temporarily probable. His father, delighted with his son's progress in his studies, sent him first to the neighboring Madaura, and then to Carthage, some two days' journey away. A year's enforced idleness, while the means for this more expensive schooling were being accumulated, proved a time of moral deterioration; but we must be on our guard against forming our conception of Augustine's vicious living from the Confessiones alone. To speak, as Mommsen does, of " frantic dissipation " is to attach too much weight to his own penitent expressions of self-reproach. Looking back as a bishop, he naturally regarded his whole life up to the " conversion " which led to his baptism as a period of wandering from the right way; but not long after this conversion, he judged differently, and found, from one point of view, the turning point of his career in his taking up philosophy -in his nineteenth year. This view of his early life, which may be traced also in the Confessiones, is probably nearer the truth than the popular conception of a youth sunk in all kinds of immorality. When he began the study of rhetoric at Carthage, it is true that (in company with comrades whose ideas of pleasure were probably much more gross than his) he drank of the cup of sensual pleasure. But his ambition prevented him from allowing his dissipations to interfere with his studies. His son Adeodatus was born in the summer of 372, and it was probably the mother of this child whose charms enthralled him soon after his arrival at Carthage about the end of 370. But he remained faithful to her until about 385, and the grief which he felt at parting from her shows what the relation had been. In the view of the civilization of that period, such a monogamous union was distinguished from a formal marriage only by certain legal restrictions, in addition to the informality of its beginning and the possibility of a voluntary dissolution. Even the Church was slow to condemn such unions absolutely, and Monnica seems to have received the child and his mother publicly at Thagaste. In any case Augustine was known to Carthage not as a roysterer but as a quiet honorable student. He was, however, internally dissatisfied with his life. The Hortensius of Cicero, now lost with the exception of a few fragments, made a deep impression on him. To know the truth was henceforth his deepest wish. About the time when the contrast between his ideals and his actual life became intolerable, he learned to conceive of Christianity as the one religion which could lead him to the attainment of his ideal. But his pride of intellect held him back from embracing it earnestly; the Scriptures could not bear comparison with Cicero; he sought for wisdom, not for humble submission to authority. In this frame of mind he was ready to be affected by the so-called "Manichean propaganda" which was then actively carried on in Africa, without apparently being much hindered by the imperial edict against assemblies of the sect. Two things especially attracted him to the Manicheans: they felt at liberty to criticize the Scriptures, particularly the Old Testament, with perfect freedom; and they held chastity and self-denial in honor. The former fitted in with the impression which the Bible had made on Augustine himself; the latter corresponded closely to his mood at the time. The prayer which he tells us he had in his heart then, " Lord, give me chastity and temperance, but not now," may be taken as the formula which represents the attitude of many of the Manichean auditores. 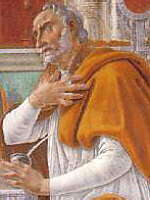 Among these Augustine was classed during his nineteenth year; but he went no further, though he held firmly to Manicheanism for nine years, during which he endeavored to convert all his friends, scorned the sacraments of the Church, and held frequent disputations with catholic believers. Having finished his studies, he returned to Thagaste and began to teach grammar, living in the house of Romanianus, a prominent citizen who had been of much service to him since his father's death, and whom he converted to Manicheanism. Monnica deeply grieved at her son's heresy, forbade him her house, until reassured by a vision that promised his restoration. She comforted herself also by the word of a certain bishop (probably of Thagaste) that "the child of so many tears could not be lost." He seems to have spent little more than a year in Thagaste, when the desire for a wider field, together with the death of a dear friend, moved him to return to Carthage as a teacher of rhetoric. The next period was a time of diligent study, and produced (about the end of 380) the treatise, long since lost, De pulchro et apto. Meanwhile the hold of Manicheanism on him was loosening. Its feeble cosmology and metaphysics had long since failed to satisfy him, and the astrological superstitions springing from the credulity of its disciples offended his reason. The members of the sect, unwilling to lose him, had great hopes from a meeting with their leader Faustus of Mileve; but when he came to Carthage in the autumn of 382, he too proved disappointing, and Augustine ceased to be at heart a Manichean. He was not yet, however, prepared to put anything in the place of the doctrine he had held, and remained in outward communion with his former associates while he pursued his search for truth. Soon after his Manichean convictions had broken down, he left Carthage for Rome, partly, it would seem, to escape the preponderating influence of his mother on a mind which craved perfect freedom of investigation. Here he was brought more than ever, by obligations of friendship and gratitude, into close association with Manicheans, of whom there were many in Rome, not merely auditores but perfecti or fully initiated members. This did not last long, however, for the prefect Symmachus sent him to Milan, certainly before the beginning of 385, in answer to a request for a professor of rhetoric. The change of residence completed Augustine's separation from Manicheanism. He listened to the preaching of Ambrose and by it was made acquainted with the allegorical interpretation of the Scriptures and the weakness of the Manichean Biblical criticism, but he was not yet ready to accept catholic Christianity. His mind was still under the influence of the skeptical philosophy of the later Academy. This was the least satisfactory stage in his mental development, though his external circumstances were increasingly favorable. He had his mother again with him now, and shared a house and garden with her and his devoted friends Alypius and Nebridius, who had followed him to Milan; his assured social position is shown also by the fact that, in deference to his mother's entreaties, he was formally betrothed to a woman of suitable station. As a catechumen of the Church, he listened regularly to the sermons of Ambrose. The bishop, though as yet he knew nothing of Augustine's internal struggles, had welcomed him in the friendliest manner both for his own and for Monnica's sake. Yet Augustine was attracted only by Ambrose's eloquence, not by his faith; now he agreed, and now he questioned. Morally his life was perhaps at its lowest point. On his betrothal, he had put away the mother of his son; but neither the grief which he felt at this parting nor regard for his future wife, who was as yet too young for marriage, prevented him from taking a new concubine for the two intervening years. Sensuality, however, began to pall upon him, little as he cared to struggle against it. His idealism was by no means dead; he told Romanian, who came to Milan at this time on business, that he wished he could live altogether in accordance with the dictates of philosophy; and a plan was even made for the foundation of a community retired from the world, which should live entirely for the pursuit of truth. With this project his intention of marriage and his ambition interfered, and Augustine was further off than ever from peace of mind. In his thirty-first year he was strongly attracted to Neoplatonism by the logic of his development. The idealistic character of this philosophy awoke unbounded enthusiasm, and he was attracted to it also by its exposition of pure intellectual being and of the origin of evil. These doctrines brought him closer to the Church, though he did not yet grasp the full significance of its central doctrine of the personality of Jesus Christ. In his earlier writings he names this acquaintance with the Neoplatonic teaching and its relation to Christianity as the turning-point of his life. The truth, as it may be established by a careful comparison of his earlier and later writings, is that his idealism had been distinctly strengthened by Neoplatonism, which had at the same time revealed his own will, and not a natura altera in him, as the subject of his baser desires. This made the conflict between ideal and actual in his life more unbearable than ever. Yet his sensual desires were still so strong that it seemed impossible for him to break away from them. Help came in a curious way. A countryman of his, Pontitianus, visited him and told him things which he had never heard about the monastic life and the wonderful conquests over self which had been won under its inspiration. Augustine's pride was touched; that the unlearned should take the kingdom of heaven by violence, while he with all his learning was still held captive by the flesh, seemed unworthy of him. When Pontitianus had gone, with a few vehement words to Alypius, he went hastily with him into the garden to fight out this new problem. Then followed the scene so often described. Overcome by his conflicting emotions he left Alypius and threw himself down under a fig-tree in tears. From a neighboring house came a child's voice repeating again and again the simple words Tolle, lege, " Take up and read." It seemed to him a heavenly indication; he picked up the copy of St. Paul's epistles which he had left where he and Alypius had been sitting, and opened at Romans xiii. When he came to the words, " Let us walk honestly as in the day; not in rioting and drunkenness, not in chambering and wantonness," it seemed to him that a decisive message had been sent to his own soul, and his resolve was taken. Alypius found a word for himself a few lines further, " Him that is weak in the faith receive ye;" and together they went into the house to bring the good news to Monnica. This was at the end of the summer of 386. Augustine, intent on breaking wholly with his old life, gave up his position, and wrote to Ambrose to ask for baptism. The months which intervened between that summer and the Easter of the following year, at which, according to the early custom, he intended to receive the sacrament, were spent in delightful calm at a country-house, put at his disposal by one of his friends, at Cassisiacum (Casciago, 47 m. n. by w. of Alilan). Here Monnica, Alypius, Adeodatus, and some of his pupils kept him company, and he still lectured on Vergil to them and held philosophic discussions. The whole party returned to Milan before Easter (387), and Augustine, with Alypius and Adeodatus, was baptized. Plans were then made for returning to Africa; but these were upset by the death of Monnica, which took place at Ostia as they were preparing to cross the sea, and has been described by her devoted son in one of the most tender and beautiful passages of the Confessiones. Augustine remained at least another year in Italy, apparently in Rome, living the same quiet life which he had led at Cassisiacum, studying and writing, in company with his countryman Evodius, later bishop of Uzalis. Here, where he had been most closely associated with the Manicheans, his literary warfare with them naturally began; and he was also writing on free will, though this book was only finished at Hippo in 391. In the autumn of 388, passing through Carthage, he returned to Thagaste, a far different man from the Augustine who had left it five years before. Alypius was still with him, and also Adeodatus, who died young, we do not know when or where. Here Augustine and his friends again took up a quiet, though not yet in any sense a monastic, life in common, and pursued their favorite studies. About the beginning of 391, having found a friend in Hippo to help in the foundation of what he calls a monastery, he sold his inheritance, and was ordained presbyter in response to a general demand, though not without misgivings on his own part. The years which he spent in the presbyterate (391-395) are the last of his formative period. The very earliest works which fall within the time of his episcopate show us the fully developed theologian of whose special teaching we think when we speak of Augustinianism. There is little externally noteworthy in these four years. He took up active work not later than the Easter of 391, when we find him preaching to the candidates for baptism. The plans for a monastic community which had brought him to Hippo were now realized. In a garden given for the purpose by the bishop, Valerius, he founded his monastery, which seems to have been the first in Africa, and is of especial significance because it maintained a clerical school and thus made a connecting link between monastics and the secular clergy. Other details of this period are that he appealed to Aurelius, bishop of Carthage, to suppress the custom of holding banquets and entertainments in the churches, and by 395 had succeeded, through his courageous eloquence, in abolishing it in Hippo; that in 392 a public disputation took place between him and a Manichean presbyter of Hippo, Fortunatus; that his treatise De fide et symbols was prepared to be read before the council held at Hippo October 8, 393; and that after that he was in Carthage for a while, perhaps in connection with the synod held there in 394. The intellectual interests of these four years are more easily determined, principally concerned as they are with the Manichean controversy, and producing the treatises De utilitate credendi (391), De duabus animabus contra Manichaos (first half of 392), and Contra Adimantum (394 or 395). His activity against the Donatists also begins in this period, but he is still more occupied with the Manicheans, both from the recollections of his own past and from his increasing knowledge of Scripture, which appears, together with a stronger hold on the Church's teaching, in the works just named, and even more in others of this period, such as his expositions of the Sermon on the Mount and of the Epistles to the Romans and the Galatians. Full as the writings of this epoch are, however, of Biblical phrases and terms,-grace and the law, predestination, vocation, justification, regeneration-a reader who is thoroughly acquainted with Neoplatonism will detect Augustine's avid love of it in a Christian dress in not a few places. He has entered so far into St. Paul's teaching that humanity as a whole appears to him a massa peccati or peccatorum, which, if left to itself, that is, without the grace of God, must inevitably perish. However much we are here reminded of the later Augustine, it is clear that he still held the belief that the free will of man could decide his own destiny. He knew some who saw in Romans ix an unconditional predestination which took away the freedom of the will; but he was still convinced that this was not the Church's teaching. His opinion on this point did not change till after he was a bishop. The more widely known Augustine became, the more Valerius, the bishop of Hippo, was afraid of losing him on the first vacancy of some neighboring see, and desired to fix him permanently in Hippo by making him coadjutor-bishop,-a desire in which the people ardently concurred. Augustine was strongly opposed to the project, though possibly neither he nor Valerius knew that it might be held to be a violation of the eighth canon of Niema, which forbade in its last clause " two bishops in one city "; and the primate of Numidia, Megalius of Calama, seems to have raised difficulties which sprang at least partly from a personal lack of confidence. But Valerius carried his plan through, and not long before Christmas, 395, Augustine was consecrated by Megalius. It is not known when Valerius died; but it makes little difference, since for the rest of his life he left the administration more and more in the hands of his assistant. Space forbids any attempt to trace events of his later life; and in what remains to be said, biographical interest must be largely our guide. We know a considerable number of events in Augustine's episcopal life which can be surely placed-the so-called third and eighth synods of Carthage in 397 and 403, at which, as at those still to be mentioned, he was certainly present; the disputation with the Manichean Felix at Hippo in 404; the eleventh synod of Carthage in 407; the conference with the Donatists in Carthage, 411; the synod of Mileve, 416; the African general council at Carthage, 418; the journey to Caesarea in Mauretania and the disputation with the Donatist bishop there, 418; another general council in Carthage, 419; and finally the consecration of Eraclius as his assistant in 426. His special and direct opposition to Manicheanism did not last a great while after his consecration. About 397 he wrote a tractate Contra epistolam [Manichcet] quam vocant fundamenti; in the De agone christiano, written about the same time, and in the Confessiones, a little later, numerous anti-Manichean expressions occur. After this, however, he only attacked the Manicheans on some special occasion, as when, about 400, on the request of his "brethren," he wrote a detailed rejoinder to Faustus, a Manichean bishop, or made the treatise De natura boni out of his discussions with Felix; a little later, also, the letter of the Manichean Secundinus gave him occasion to write Contra Secundinum, which, in spite of its comparative brevity, he regarded as the best of his writings on this subject. In the succeeding period, he was much more occupied with anti-Donatist polemics, which in their turn were forced to take second place by the emergence of the Pelagian controversy. It has been thought that Augustine's anti-Pelagian teaching grew out of his conception of the Church and its sacraments as a means of salvation; and attention was called to the fact that before the Pelagian controversy this aspect of the Church had, through the struggle with the Donatists, assumed special importance in his mind. But this conception should be denied. It is quite true that in 395 Augustine's views on sin and grace, freedom and predestination, were not what they afterward came to be. But the new trend was given to them before the time of his anti-Donatist activity, and so before he could have heard anything of Pelagius. What we call Augustinianism was not a reaction against Pelagianism; it would be much truer to say that the latter was a reaction against Augustine's views. He himself names the beginning of his episcopate as the turning-point. Accordingly, in the first thing which he wrote after his consecration, the De diversis gucestionibus ad Simplicianum (396 or 397), we come already upon the new conception. In no other of his writings do we see as plainly the gradual attainment of conviction on any point; as he himself says in the Retractationes, he was laboring for the free choice of the will of man, but the grace of God won the day. So completely was it won, that we might set forth the specifically Augustinian teaching on grace, as against the Pelagians and the Massilians, by a series of quotations taken wholly from this treatise. It is true that much of his later teaching is still undeveloped here; the question of predestination (though the word is used) does not really come up; he is not clear as to the term " election"; and nothing is said of the " gift of perseverance." But what we get on these points later is nothing but the logical consequence of that which is expressed here, and so we have the actual genesis of Augustine's predestinarian teaching under our eyes. It is determined by no reference to the question of infant baptism -- still less by any considerations connected with the conception of the Church. The impulse comes directly from Scripture, with the help, it is true, of those exegetical thoughts which he mentioned earlier as those of others and not his own. To be sure, Paul alone can not explain this doctrine of grace; this is evident from the fact that the very definition of grace is non-Pauline. Grace is for Augustine, both now and later, not the misericordia peccata condonans of the Reformers, as justification is not the alteration of the relation to God accomplished by means of the accipere remissionem. Grace is rather the misericordia which displays itself in the divine inspiratio and justification is justum or pium fieri as a result of this. We may even say that this grace is an interne illuminatio such as a study of Augustine's Neoplatonism enables us easily to understand, which restores the connection with the divine bonum esse. He had long been convinced that " not only the greatest but also the smallest good things can not be, except from him from whom are all good things, that is, from God;" and it might well seem to him to follow from this that faith, which is certainly a good thing, could proceed from the operation of God alone. This explains the idea that grace works like a law of nature, drawing the human will to God with a divine omnipotence. Of course this Neoplatonic coloring must not be exaggerated; it is more consistent with itself in his earlier writings than in the later, and he would never have arrived at his predestinarian teaching without the New Testament. With this knowledge, we are in a position to estimate the force of a difficulty which now confronted Augustine for the first time, but never afterward left him, and which has been present in the Roman Catholic teaching even down to the Councils of Trent and the Vatican. If faith depends upon an action of our own, solicited but not caused by vocation, it can only save a man when, per fidem gratiam accipiens, he becomes one who not merely believes in God but loves him also. But if faith has been already inspired by grace, and if, while the Scripture speaks of justification by faith, it is held (in accordance with the definition of grace) that justification follows upon the infitsio caritatis, -then either the conception of the faith which is God-inspired must pass its fluctuating boundaries and, approach nearer to that of caritas, or the conception of faith which is unconnected with caritas will render the fact of its inspiration unintelligible and justification by faith impossible. Augustine's anti-Pelagian writings set forth this doctrine of grace more clearly in some points, such as the terms " election," " predestination," " the gift of perseverance," and also more logically; but space forbids us to show this here, as the part taken in this controversy by Augustine is so fully detailed elsewhere. In order to arrive at a decision as to what influence the Donatist controversy had upon Augustine's intellectual development, it is necessary to see how long and how intensely he was concerned with it. We have seen that even before he was a bishop he was defending the catholic Church against the Donatists; and after his consecration he took part directly or indirectly in all the important discussions of the matter, some of which have been already mentioned, and defended the cause of the Church in letters and sermons as well as in his more formal polemical writings. The first of these which belongs to the period of his episcopate, Contra partem Donati, has been lost; about 400 he wrote the two cognate treatises Contra epistulam Parmeniani (the Donatist bishop of Carthage) and De baptismo contra Donatistas. He was considered by the schismatics as their chief antagonist, and was obliged to defend himself against a libelous attack on their part in a rejoinder now lost. From the years 401 and 402 we have the reply to the Donatist bishop of Cirta, Contra epistulam Petiliani, and also the Epistula ad catholicos de unitate ecclesioe. The conflict was now reaching its most acute stage. After the Carthaginian synod of 403 had made preparations for a decisive debate with the Donatists, and the latter had declined to fall in with the plan, the bitterness on both sides increased. Another synod at Carthage the following year decided that the emperor should be asked for penal laws against the Donatists. Honorius granted the request; but the employment of force in matters of belief brought up a new point of discord between the two sides. When these laws were abrogated (409), the plan of a joint conference was tried once more in June, 411, under imperial authority, nearly 300 bishops being present from each side, with Augustine and Aurelius of Carthage as the chief representatives of the Catholic cause. In the following year, the Donatists proving insubordinate, Honorius issued a new and severer edict against them, which proved the beginning of the end for the schism. For these years from 405 to 412 we have twenty-one extant letters of Augustine's bearing on the controversy, and there were eight formal treatises, but four of these are lost. Those which we still have are: Contra Cresconium grammaticum (about 406); De unico baptismio (about 410 or 411), in answer to a work of the same name by Petilian; the brief report of the conference (end of 411); and the Liber contra Donatistas post collationem (probably 412). The earliest of the extant works against the Donatists present the same views of the Church and its sacraments which Augustine developed later. The principles which he represented in this conflict are merely those which, in a simpler form, had either appeared in the anti-Donatist polemics before his time or had been part of his own earlier belief. What he did was to formulate them with more dogmatic precision,. and to permeate the ordinary controversial theses with his own deep thoughts on unitas, caritas, and inspiratio gratice in the Church, thoughts which again trace their origin back to his Neoplatonic foundations. In the course of the conflict he changed his opinion about the methods to be employed; he had at first been opposed to the employment of force, but later came to the " Compel them to come in " point of view. It may well be doubted, however, if the practical struggle with the schismatics had as much to do with Augustine's development as has been supposed. Far more weight must be attached to the fact that Augustine had become a presbyter and a bishop of the catholic Church, and as such worked continually deeper into the ecclesiastical habit of thought. This was not hard for the son of Monnica and the reverent admirer of Ambrose. His position as a bishop may fairly be said to be the only determining factor in his later views besides his Neoplatonist foundation, his earnest study of the Scripture, and the predestinarian conception of grace which he got from this. Everything else is merely secondary. Thus we find Augustine practically complete by the beginning of his episcopate-about the time when he wrote the Confessiones. It would be too much to say that his development stood still after that; the Biblical and ecclesiastical coloring of his thoughts becomes more and more visible and even vivid; but such development as this is no more significant than the effect of the years seen upon a strong face; in fact, it is even less observable here-for while the characteristic features of his spiritual mind stand out more sharply as time goes on with Augustine, his mental force shows scarcely a sign of age at seventy. His health was uncertain after 386, and his body aged before the time; on Sept. 26, 426, he solemnly designated Eraclius (or Heraclius) as his successor, though without consecrating him bishop, and transferred to him such a portion of his duties as was possible. But his intellectual vigor remained unabated to the end. We see him, as Prosper depicts him in his chronicle, " answering the books of Julian in the very end of his days, while the on-rushing Vandals were at the gates, and gloriously persevering in the defense of Christian grace." In the third month of the siege of Hippo by the barbarian invaders, he fell ill of a fever and, after lingering more than ten days, died Aug. 28, 430. He was able to read on his sick-bed; he had the Penitential Psalms placed upon the wall of his room where he could see them. Meditating upon them, he fulfilled what he had often said before, that even Christians revered for the sanctity of their lives, even presbyters, ought not to leave the world without fitting thoughts of penitence. Of works not yet mentioned, those written after 395 and named in the Retractationes, may be classified under three heads-exegetical works; minor dogmatic, polemical, and practical treatises; and a separate class containing four more extensive works of special importance. The earliest of the minor treatises is De catechizandis rudibus (about 400), interesting for its connection with the history of catechetical instruction and for many other reasons. A brief enumeration of the others will suffice; they are: De opera monachorum (about 400); De bono conjugali and De sancta virginitate (about 401), both directed against Jovinian's depreciation of virginity; De deviation damonum (between 406 and 411); De fide et operibus (413), a completion of the argument in the De spiritu et litera, useful for a study of the difference between the Augustinian and the Lutheran doctrines of grace; De cura pro mortuis, interesting as showing his attitude toward superstition within the Church; and a few others of less interest. We come now to the four works which have deserved placing in a special category. One is the De doctrina christiana (begun about 397, finished 426), important as giving his theory of scriptural interpretation and homiletics; another is the Enchiridion de fide, spe, et caritate (about 421), noteworthy as an attempt at a systematic collocation of his thoughts. There remain the two doctrinal masterpieces, the De trinitate (probably begun about 400 and finished about 416) and the De civitate Dei (begun about 413, finished about 426). The last-named, beginning with an apologetic purpose, takes on later the form of a history of the City of God from its beginnings.